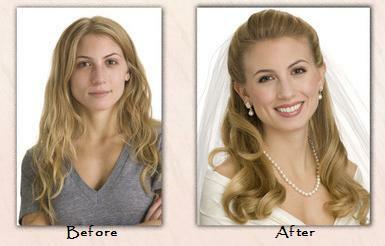 At Be Yourself Beauty, we have become known as the bridal beauty experts. Over the years, brides have relied upon us to help them look their absolute best on their special day. We work very closely with brides to customize their look according to their needs; taking into consideration everything from time of day, bridesmaid dress, floral choices, and whether the photographer is shooting color or black and white. At Be Yourself Beauty, we’re a salon in the casual, get-together sort of way and perform all of our services in the comfort of home, whether it's ours or yours, or a home away from home such as a B&B or Inn. When it comes to taking special care of our clients, we believe that part of looking and feeling your best comes from enjoying life’s experiences, and that includes the time you spend with us. We’ll do everything we can to make your visit with us a moment you can look forward to. We’ll bring the best of The Be Yourself Beauty team to wherever you need us. Makeup and Hair Services can be Customized Just for YOU! Weddings are an extraordinary time in your life. We take the worry and stress out of your hair and make-up planning with a variety of options tailored to meet your needs. All our services are completely "customizable" to meet your individual needs. Would like us to come to you, or would you like to come to us? Would you like us to stay for the entire event or just help you get ready? ....the option is entirely yours. Let us create the look you are dreaming of for your special day! We'll address each detail of your style so that we can achieve the perfect look that is you for your wedding day. Feel stress-free knowing that your look was created just for you and will be re-created on your wedding day in a professional and timely fashion. Tattoo, scars, birth mark coverage, lash extensions, hair extensions available upon request. Please contact us for pricing information so that we can Customize our Services just for You. Although we do not have a minimum, prices may be slightly higher for services provided for parties less than four. * Please Note, travel and gratuity are not included in the above rates. Travel fees will vary by location. 3. Number of people for make-up application /hair styling services. In order to make things easier for everyone, we have a first come, first serve policy regarding bookings. A completed and signed contract, along with retainer is all that is required to reserve your date. I just wanted to thank you again for everything on the 15th! Mike and I have been traveling since then and are currently in Shanghai (otherwise we would send you a hand written note!) but I wanted to let you know how much we appreciated your work and your efforts to help the afternoon go so smoothly! You certainly made my mothers and I beautiful, and we also appreciated your help with the pictures, flowers and making sure we got on the road in one piece! Good thing you were behind the minibus to notice the back door was ajar! I cannot tell you how many compliments I received on my makeup, we will certainly send any in search of a cosmetic artist your way. It was truly a pleasure meeting you, I hope you have a wonderful rest of your summer and thanks again for playing such a big part in making the day so memorable! Nancy, Thank you so much for everything for the wedding! IT was beautiful! I am sending along some photos for you to see! As soon as the photographers photos come on on pictage, I will send you the link! Nancy Hathaway-Hopowiec was extremely accomodating to our needs. Professional in demeanor, she has extensive expertise in her field but, simultaneously, is responsive to the wishes of her clients. Nancy is very professional and talented. She made me feel like the prettiest bride! I highly recommend her to anyone, she'll bring out the best in you with her make-up expertise! Choosing a make-up artist for your wedding day is an important decision - you want to obviously look beautiful (in person and in pictures!) but also want to choose someone who will add to the experience of one of the most memorable days of your life. I chose Nancy after seeing the before and after pictures on her website and talking with her on the phone. From our first conversation, I was impressed by her professional, caring and very calm personality. She was very flexible when I wanted to make last-minute changes to my make-up. On the morning of my wedding she arrived at my apartment to do my make-up and one of my bridesmaid's. Nancy was a very calming influence on what could be a stressful day. She put me at ease with her professional nature and competence. She was absolutely wonderful. She obviously takes great pride in her work and was meticulous. My make-up looked great - in person and in pictures and I received a lot of compliments. I would highly recommend Nancy's services to any bride-to-be!!! Nancy Hathaway-Hopowiec is a consummate professional. She takes great pride in her work and it shows in her artistry and top-notch service. Her products are natural and of the highest quality, and she is always responsive to any questions and all requests. Nancy is a gifted make-up artist and so reasonably priced, approachable and wonderful to work with. She met with me first for a trial make-up session. I was especially impressed with the way she really listened to my thoughts and preferences as I like a natural look. Using her expertise based on my preferences, she made magic! In addition, Nancy has a special quality about her that is very soothing. She radiates peace and calm. 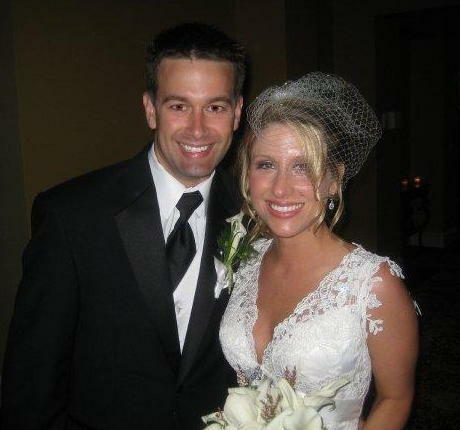 On my wedding day, Nancy's talents made me feel beautiful and her inner peace put me at ease. Nancy is truly a gem! Nancy took the time to consult with me before the actual wedding day, she tried many different make up looks, and photographed them so we could decide what looked best. She was in constant communication with me, and takes great pride in her work. She even met the wedding party at our hotel the day of the wedding, and made use of that space to get all of the girl's make up done. She was very conscientious, and made sure everyone was happy with their look before moving on to the next girl. She did a wonderful job, and even helped me to cover up some unexpected blemishes that came up that day, so they were barely (if at all) noticeable. We got SO many compliments on our make up! I would absolutely recommend Nancy to anyone looking for a professional, and very personable make up artist! Nancy has great products and a true talent to create a personalized and perfect look. I would strongly recommend her and have to other brides. My bridesmaids and I were complimented numerous times on our makeup and you will be happy having her at your special event she is such a nice person. Thank YOU so much for making my day Perfect! Everyone was so happy with the makeup and hair and everyone looked so beautiful! I felt like a Princess. 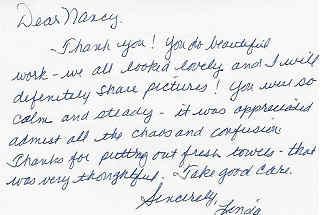 "Nancy is very easy going and such a nice person to work with. She has a way of putting people at ease on what can sometimes be a stressful day"
There’s a lot to do on the journey to achieving the desired look before you walk down the aisle, not only for yourself but for your bridesmaids and your guests. All the brides that come to Be Yourself Beauty have one thing in common, they all want to look their most beautiful on their special day and Be Yourself Beauty is here to help make that dream come true for you.